Gorgeous bright deep water waterfront home in private, gated enclave located just off Intracoastal with easy (no fixed bridge) ocean access. Master bedroom on 1st floor with panoramic views of channel & community park. Spacious 5 Bedroom, 5.5 Bath with Private Dock for up to 65 foot boat (10''); $500,000+ in upgrades inc: $50,000 Upgraded Pool, Top Shelf Appliances (Wolf, Twin Eagle, Sub Zero, Miele, LG); $50,000+ landscaping upgrade; Flooring (Creme De Marfil Select), Upgraded Wood Floors & top quality carpeting); Marble Pavers; Upgraded Garage & Expanded Kitchen; Bose Invisible Home Theater in family room & Bose invisible audio systems in great room, master bedroom & outdoor Lanai; Video Surveillance; Icynene Insulation; Tongue & Groove Expanded Lanai; Coffered Ceilings; Custom MirrorsAdditional upgrades include: outdoor glass tile TV wall with brand new Smart TV; oak main stairs; outdoor lighting, built-ins in family room; many upgraded pool finishes; marble pavers on pool deck; crown molding throughout; custom millwork in great room / dining area; upgraded cabinets in kitchen and bathroom; outdoor gourmet BBQ with $25,000 Twin Eagle grill; extensive landscaping upgrades including beautiful bamboo privacy hedges; Two home runs for both Direct TV and Comcast Xfinity; Outdoor shower; 2 working Jet Ski lifts; Dock is 75 feet in length; custom garage shelving and floor covering; Custom brand new his and her closets in master bedroom. New Nest thermostats, Ring Doorbell and August Smart front door lock. This home faces the preserve area (so there is no house opposite it), and it is located in the middle of the community a good distance away from the Donald Ross bridge. The house is filled with sunlight as it faces east and west and it is a Carrington which is by far the most popular model in the community. With no fixed bridge access to the Jupiter or Palm Beach Inlet, Frenchman's Harbor is a great place for a boater to call home. Frenchman's Harbor is a guard-gated waterfront community just off the Intracoastal waterway that was built by Toll Brothers in 2013. 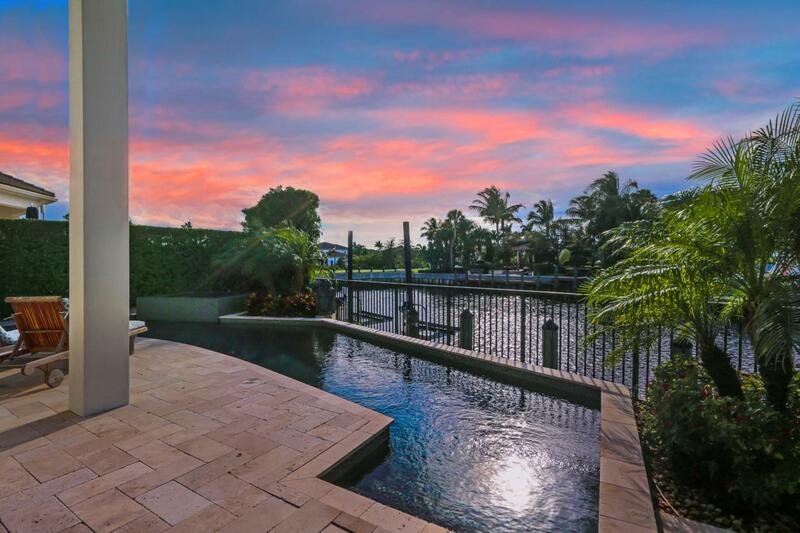 It is one of the most beautiful communities in North Palm Beach and a very private enclave of just 48 single family homes & 30 carriage homes that is surrounded by preserve on one side and bordered by the Intracoastal waterway on the other side. It is a great location being only a few minutes' drive from the Juno Beach pier and all the shopping, entertainment and cultural venues Jupiter, Palm Beach Gardens and North Palm Beach have to offer. The community is also just a short drive to the Palm Beach International airport. All of the homes have their own private pool but there is also a community pool, community park and nice walking paths. The HOA fees are less than $1,000 per month.